When the Soviets adopted the first BTR-60P vehicles in the early 1960s it soon dawned on them that it was ill-prepared to operate on modern battlefields due to the problems of air burst artillery raining fragments down on those below, as well as the twin problems of both chemical and nuclear battlefields as the open design did not lead to protection of the troops. As Soviet testing at Sary Shagan and other locations had shown, if protected properly troops could survive long enough on a nuclear battlefield to carry out combat missions. 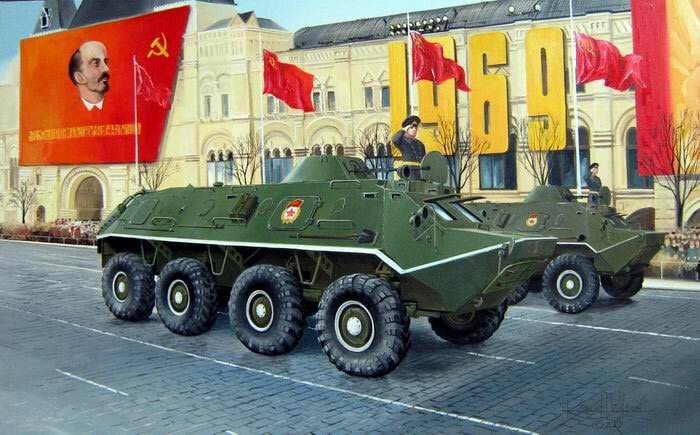 The next vehicle, the BTR-60PA, corrected these problems with an armored roof, but then restricted combat from inside the vehicles to a limited number of firing ports which meant nothing heavier than small arms. Since the US was then fielding the M113 and the UK the FV432, a heavier weapon was needed to deal with them as well as low flying ground support aviation. The solution was to add a small turret fitted with both the 14.5mm KPVT machine gun, a hard-hitting anti-material weapon, and a 7.62mm SGMB (later PKT) machine gun for antipersonnel duties. This vehicle, the GAZ-49B or BTR-60PB, was fielded in 1966 and became the most widely produced variant of the series. Trumpeter has followed up its very nice BTR-60P kit with the PB and it is even better. While 243 parts from the first kit have been retained - mostly running gear - this kit adds another 260 styrene and nine etched brass parts to provide for the later model vehicle. The new kit is a match for the quality of its predecessor. Many parts are well protected (delicate ones are wrapped in foam inside the poly bag) and it also comes with two frets of etched brass. The kit also provides for a complete interior to the “control compartment” - the Russian term for the driver’s and commander’s seat area – and the “fighting compartment” with the turret and seats for the dismount infantry squad. Its construction is more akin to recent kits like the AFV or Trumpeter Stryker vehicles than the old DML BTRs. The first three steps cover just attaching the bump stops and suspension A frame brackets to the lower hull. You also have an option for the early (winch in the front of the hull plate) or late (absent) hull front plates. Also, the hull pan needs to be modified to correct it for the PB by removing bits from the P kit. It takes eight full steps before the lower hull pan is flipped over to start on the interior. Given the details on these kits it is odd they do not provide an etched grating for the water jet intake on the rear of the hull floor. Once again in Step 8 it offers option for early or late tow hook fittings. Step 10 again covers early or late fittings for the hull rear with the folding towhook assembly or no hook. Step 11 begins interior assembly with some holes needing to be drilled before installing the two floors for the “control compartment” and the “fighting compartment”. This version has two seats at the front for the driver and commander but three sets of lateral crew seats (two jump seats and two benches) for the rest of the crew. There is a considerable amount of internal binning and stowage added here as well. In Step 17 a decal is provided for the driver’s instrument panel, but as it is embossed many may simply want to paint and drybrush it. Step 18 starts the upper hull assembly. Note that if installed at this point parts J11 – the clear glass windscreens - will need to be masked. Details are added in 19-22 to include viewers and the overpressure blower (L7-20-21-25). The R-123 radio and its booster are added in Step 22. Step 23 covers the engine deck and also more early and late options for the fighting compartment hatch. In Step 27 the headlights are added, and while the box art shows all four as infrared (appearing black) two of them are clear and two are infrared; which is which appears to vary but the dominant version appears to have white on the bottom and IR on the top. Work on the turret does not begin until Step 35 and covers the breeches of the weapons. This appears to use both the KPVT and a PKT machine gun for a later model. Once more there are early and late turret shell options so pay attention to the directions. The very nice KPVT barrel (with a “slide molded” open flash suppressor) is installed in Step 36. Pay attention as it appears this turret set of parts is also intended for the later BRDM-2, BTR-70 and BTR-80 kits forecast for later in 2012, so only one part is of use for this version. 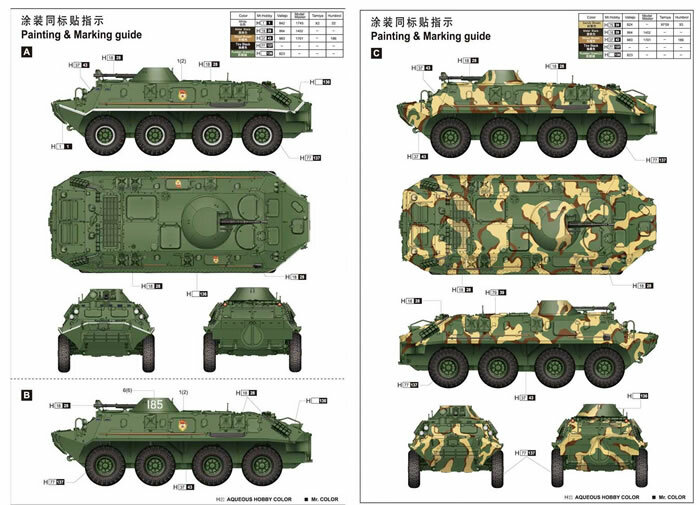 Decals and finishing directions are provided for only three vehicles: a “parade queen” version with white trim and Soviet Guards badges in Soviet Khaki #2 (an olive drab shade); one with bort number 185 in white from a Guards motorized rifle regiment; and one with a three-color camouflage scheme (sand and red brown over Soviet Khaki #2). However, Trumpeter does provide a “number jungle” for creating any other bort number desired.